The SureFill 300 bottle filling machine permites full access into the machine for cleaning, inspection, maintenance, and changeover. Service Industries is partners with Sepha and is their exculsive distributor of blister packaging, deblistering, and non-destructive leak testing machines for the U.S., Canada, and Puerto Rico. The open design of the SureFill 300 bottle filling machine permits full access into the machine for cleaning, inspection, maintenance, and changeover. The sliding rear guard doors facilitate easy access and the cantilevered sprockets eliminate unnecessary cross shafts, improving access. 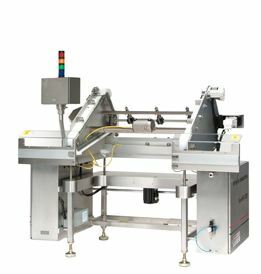 The chain and slat guide systems have been designed to minimize the number of discrete parts on the bottle filler, reducing cleaning time and eliminating multiple alignment and adjustment points. Tool-less changeover is easily accomplished with our slat filler. All necessary parts can be removed for cleaning and changeover without tools. The SureFill 300 slat filling machine also incorporates our unique Patent Pending SureClean conveyor design. Conveyor systems can be customized to fit specific requirements. Throughput of up to 300 bottles per minute provides the highest productivity for your bottle filling applications. Uses industry standard slats and other legacy parts to minimize retooling costs. Open design provides total access for easy cleaning, inspection, and changeover. Servo-driven for efficiency, flexibiltity, and precise control. Allen Bradley PLC control package with open architecture for easy validation, industry-wide acceptance, and local support.